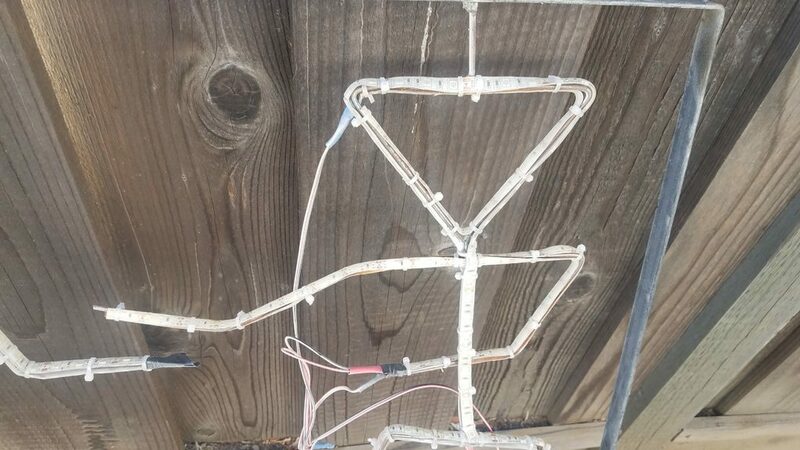 Instructables user “r570sv” needed a marker to find his way back to camp at Burning Man 2018, and decided to make a trio of LED dancing robots that could be raised high up on a pole. The idea is that he could see this from anywhere in the desert, making it great for this particular event—and perhaps for later expeditions, such as beach camping. The robots were bent out of 1/8” steel wire, with single-color red LED strips affixed to it using zip ties. Three robotic panels are sequentially lit up using an Arduino and a bank of relays to form animations, similar to a neon sign. The flagpole used to raise the animated sculpture was affixed to his truck, creating a sturdy base as well as convenient source of 12V power. I wanted to make something so I could find our camp at night at Burning Man 2018. 2018 was a robot theme and I’m a fan of neon but no way was gonna head that route so I came up with an idea about a dancing cocktail glass kinda robot. We beach camp and have sand rails so I know how useful flying some kind of flag can be during the day and some kind of LED light pole is at night. So I figured, use it an burning man and keep using when we go to the beach. So using metal and welding is in my wheel house and I’m good with Arduinos so that’s the medium that I chose to implement this project in.